When powering through a choppy sea, the cockpit of a motorboat can be very exposed. Forward and aft canopies will protect the helmsman and passengers from spray without compromising boat appearance or performance. Protection of instruments, seating and equipment is also an essential consideration. All our motorboat covers are bespoke, constructing using either coated Marine Acrylic or PVC, both available in a wide range of colours. The design and specification of each order is discussed in detail with the client or boatyard. Construction sheets are completed to ensure all requirements are met. Framework is constructed using Â¾â€, 7/8â€ or 1â€ diameter stainless steel tubing with solid stainless steel fittings. Appropriate fixings or track are used to attach the canopy to the windscreen. Aft, side or front windows, depending upon the boat design, are fitted ensuring clear visibility. All entries are zipped with roll up doors and ties. The bar pockets are zipped for easy removal. Reinforcement is fitted at all chafe points. For versatility the canopy can be manufactured in sections which are joined by a series of zips allowing the removal of sides and aft panels. 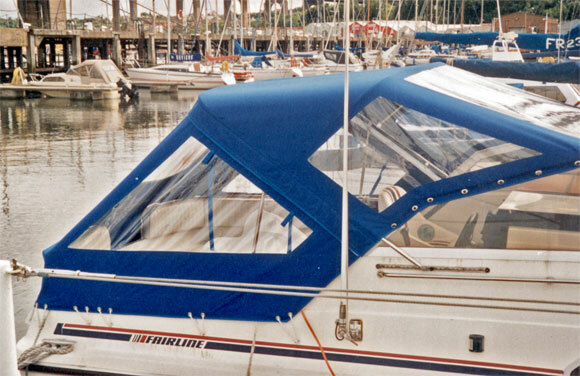 A Tonneau or Flybridge cover can also be very useful on a sports boat and motor cruiser. The cover will prevent water collecting in the cockpit, or protect seating and instruments on the Flybridge. It can be tensioned with shock cord and stainless steel hooks, or fixed in place with fittings to suit the boat. A telescopic pole can be supplied to raise the cover in the centre and prevent water from pooling.